How Much Extra Emergency/Reserve Capacity Does Your Solar Power System Need? This backup battery setup looks good, but there’s one huge mistake the prepper made in developing it. Do you know what it was? The answer is at the bottom of the article. This is a further part of our series on solar energy. Please also visit our sections on energy in general and solar energy in particular for more related articles. There are two ways of developing a solar system for a retreat. By far the simpler is to simply go out and buy the biggest bestest system you can afford, and whatever you end up getting is what you have, and you’ll adjust and survive as best you can with what you have and the energy it provides. There’s little danger you’ll end up with ‘too much’ solar power! The more complicated way is to work out how much power you need to live your life to a certain standard of comfort and convenience, and to buy sufficient power generating capacity to provide this. If you’re just going to buy a system and hope for the best, we’d urge you to buy way more capacity than you think you might need, and way more than the sales people are telling you to get. That’s an interesting reversal – usually sales people tend to oversell and you can buy less than they tell you is necessary, but in the case of solar power, the chances are the opposite may be true (we guess salesmen undersell because the true full costs and complications can become rather daunting). Even if you’re just going to buy a system and hope for the best, you should still read through the rest of this and the associated articles in our solar power series, so you have at least some idea of the big gap between claimed power generating capabilities and the actual energy you are likely to receive (sometimes there can be a five-fold discrepancy), and can create some sort of realistic expectation for what you’ll actually be able to do with your system. In our article ‘How Much Solar Generating Capacity Do You Need‘ we looked at some of the considerations needed to match your power and energy requirements (two similar but different things, as explained here) with what to expect from solar panels. The big problem is that the output from solar panels varies more or less proportionately with the intensity of the sunlight shining on them, and the total sunlight each day can vary widely, depending on just on season, but on each day’s specific weather. So although you can work out your average daily needs for power (probably with some seasonal variations) and similarly, you can work out your average daily power generation (again with seasonal variations) the problem is that your actual daily power generation will sometimes be much higher than average (well, that’s not a problem, is it) and on other days, will be much less than average (and there’s your problem!). The other big issue with solar power is that at night, solar power reduces down to zero. You need to supplement solar power either with another power source that does work reliably at night, or with a means of storing/saving energy during the day that you can then tap into at night – the most common example of which being batteries. Clearly, you need to select a system with as much power as possible to keep you going on very low sunlight days. But there is also a point at which you can switch strategies – by increasing your battery storage capacity, you can provide yourself with additional energy reserve by storing up surplus energy on sunny days, and using that stored energy not only at night, but on days with less than anticipated sun, too. Within reason, and ignoring some minor issues, the bigger the battery reserve you have, the smaller the actual solar generating system you need, because the batteries are smoothing out the peaks and the troughs as between your energy production and your energy consumption. So, we know that the solar power you’ll generate will vary from day-to-day, and some days will have less power generated than you want, and perhaps even less than you need. There are three ways to respond to this. The first is to upgrade your solar generating capacity still further, so that you still get the energy you need, even with much less sunlight. The second is to have some alternate backup sources of power generation. The third is to have more battery capacity, so you can smooth out the peaks and the flows of daily power generation with stored battery power. In this third case, you are using batteries for two purposes. The first is to take power generated during the day and use it the immediately following night, with the expectation that come shortly after sunrise the next day, you’ll have used up your battery power (at least to the discharge level you set yourself) but that at the same time this happens, energy will be flowing back into your retreat from the solar panels. The chances are that you’ll have the same batteries doing both tasks – this is not like, for example, a motor home which might have both a starter battery for starting the engine and a separate ‘house’ battery for running appliances from. At your retreat, you simply increase the size of your battery installation and use them for both overnight and top-up during the day purposes as needed. This is a good thing for another reason too, because it means on a typical day, you’ll be discharging your total battery system less than you would with a lower capacity system, meaning you’ll have more charge/discharge cycles in total before the batteries eventually die. How Much Extra Battery Capacity to Add? To use a similar scenario to that in previous articles, if you need 20 kWh of energy a day, and if you have a system that can generate 25 kW per hour of full sunlight, let’s also assume that on average you expect to get 2 – 2.5 hours of full sunlight a day, and you have configured things on the expectation of it all working right even with only 1.125 hours of full sunlight. Maybe you could say ‘Well, we know that, no matter what, the sun will always rise, every morning, so even on the worst of all days, there will still be perhaps 15% of the full energy available for harvesting through the system. That would mean a really bad day would give you 0.34 hours of full sunlight equivalent, and you could get 6.75 kWh of energy from that weak amount of sunlight. You need 20 kWh of energy a day, so you have a 13.25 kWh shortfall. You already have a battery resource designed to give you at least 5 kWh of energy for nighttime, so it seems you need to increase your battery resource by another 8.25 kWh of net capacity to give you the ability to work through a really bad day. Now, what say you have two bad days in a row? Do you need to add still more battery capacity? Maybe, you do. But perhaps not quite as much as you might think. We’ll assume that, on the second day with very little sunlight, you’ll stop using any electrically powered things that aren’t essential. You’ll stop using your hair dryer, your dishwasher, and so on. And on the third day, you’ll cut back even further, so that your 20 kWh consumption figure drops way down to start with, approaching closer to the perhaps 6.75 kWh of energy created. Don’t get us wrong. More batteries and more panels are always good, but there comes a point where you truly do have enough, and should think of better ways to spend your prepping budget. There’s another thought that you need to keep in mind, too. Your system has been sort of designed to have enough capacity for a day’s normal use, and to recharge your 5 kWh of overnight battery capacity, but if you need it to also be able to recharge another 8.25 kWh of battery capacity, do you need to increase your array size, too? Maybe yes, but maybe also no. Here’s the surprising thing. Sooner or later, the pendulum will swing and instead of having bad days with less than average sunlight, you’ll have a normal day with normal sunlight, and even sometimes a good day with more than normal sunlight. Remember that, on average, you will get 2 – 2.5 hrs of sunlight equivalent, and you’ve designed your system to work with only 1.125 hrs of sunlight per day, and to withstand any two-day period with only 1.465 hrs of sunlight over the two days. Maybe the third day will see you back to normal, with between 2 – 2.5 hours of sunlight. Your 25 kW system will be gushing out so much energy you’ll have your batteries topped up in double-quick time, and you’ll be able to use all your appliances without any care or concern at all. And the next day, maybe you’ll get 3 or 4 hours of sunlight – you could potentially generate 100 kWh of energy in a case where you only need 20 kWh for your daily needs. On the other hand, if you now have a much larger battery reserve, they will be consuming a measurable amount of energy each day to keep ‘trickle charged’, and conditioned. We’d recommend you allow at least 1% of the total battery capacity for daily losses, and depending on the type of system you have, maybe this could rise to 2% or more. 2% of a 13.25 kWh system is 0.27 kWh for battery maintenance every day. So, where do you draw the line? For many people, roof size is one practical consideration. You’ll likely max out your roof space with these types of configurations. And the other is budget based. For those of us with finite budgets (and that is most of us) we always need to be juggling our funds between all the different ways we need to spend them, and ensuring that, just like a chain is only as strong as its weakest link, our retreat has no weak links as a consequence of also having some ridiculously strong ones. There’s another thing to consider in working up the specifications for your solar power system. You need to have redundancy built-in to the system, so that everything still works as you need it to if any one thing fails. So, for example, maybe you end up with a net battery power requirement of 5 kWh, as per the example we’ve been working through, and you find a single Solar-One battery which itself has a net 6 kWh of power. Don’t just buy it and consider your battery needs fully solved, because you have also created a part of your system with no backup/redundancy. Instead, you should buy two of these batteries. Or perhaps you find a different brand of battery that has a net capacity, per battery, of 3 kWh. Don’t just buy two. Buy three, so you can have one fail and still sufficient battery capacity remaining. Always buy (at least) one more than you need for anything and everything. And if it is an item which you have/need many of, consider buying more than one additional. For example, maybe you end up with 50 solar panels. Even though the panels are very reliable and low maintenance, we’d be tempted to buy not just one but two or three spares for ‘just in case’ scenarios in the future. So, buy the system you need, then buy an extra at least one of every item in the system. Sometimes, it might make sense to immediately deploy the extra items so as to make your system bigger and better right from day one, other times (maybe power controllers, extra cables and connectors, etc), there is no need to do this and you can keep them in reserve, so that they’re not wearing out or getting ‘used up’ or whatever other issues might apply. In the case of batteries, we’d probably immediately connect up all the batteries we had. The slight downside is a greater energy consumption every day to keep them charged, but the upside is that you are using a smaller amount of each battery’s charge each night, and so they will last more cycles in total. Should You Buy More Batteries, or More Solar Panels? So at what point does it make sense to spend money on more batteries rather than on more solar panels (or vice versa)? How much of each should you have? Prices for batteries (and the associated control and conversion equipment to charge them, monitor them, and subsequently then change their power to 110V AC for use around your retreat) and for solar panels (and all the various similar associated equipment for them) varies to a certain degree, and it is hard for us to be too definitive about that part of the equation in an article that we hope will remain useful for an extended time. But to give a quick example of some pricing at present, you could plan to spend about $5000 for a battery and related equipment that stores 12 kWh of energy (for example, these batteries), and/or you could spend about $1/watt of solar panel generating power plus, say, $1500 or so for an inverter, meaning the same $5000 would buy you about 3500 watts of power generating capacity. Note that you would only want to discharge the 12 kWh of battery to perhaps 75%, so it actually gives you 9 kWh of usable energy. If we say that on a worst case day, you’ll have under one hour of full sunlight energy equivalent, then your $5000 would buy you either 9 kWh of stored and usable energy in additional batteries, or less than 3.5 kWh of additional energy generated. All other things being equal, it would seem, with these respective prices, you would be better to spend the money on batteries. But – and here’s the thing. All things are not always equal. If you increase the size/capacity of your bank of storage batteries, you also need to have sufficient generating power to be able to charge them up – and, don’t also forget, that once you’ve charged them up, you then need to give them ongoing trickle charging to keep them charged and in good condition. Perhaps a better equivalent would be to say that if you buy the 9 kWh of extra usable battery for $5000, you also spend another $5000 to get the 3.5kW of extra solar cells so as to have additional capacity to charge the additional batteries, making a total cost to service the 9 kWh more like $10,000. So, to compare how you’d spend $10,000, one way you’d get 12 kWh (with 9 kWh usable) of batteries and maybe 3.5kW of solar cells, the other way, you’d get maybe 7 kW of solar cells and no extra battery. But, remember, you’re planning for a worst case scenario with less than one effective sunlight hour, so the 7 kWh of extra solar cells might only bring you a net 5 kWh of energy, much less than you’ll hopefully have stored and usable in your 12 kWh of extra battery. It still makes sense, after adding this extra detail, to buy batteries (and some additional supporting solar panels) than just to buy panels by themselves. Note that these numbers will vary depending on what you already have and what else extra you are looking at getting, and you should do your own sums your own way, but at least this worked example, as of late April 2014, clearly shows that for energy storage strategies, you should go big on batteries. And now, for an opposite thought. Rather than looking only at the implications of adding extra batteries and panels, think also of what you already have. In our example, with 5 kWh of battery storage, and then you add an extra 8.25 kWh for bad days, and then you add a further 12 kWh for really bad days, you also already have 25 kW of panels and a daily/daytime need for only 15 kWh of energy (plus 5 kWh at night). As soon as you transition from bad weather to average weather, you then have (in this example) 2 hours of full sunlight energy, and the panels will then give you 50 kWh of energy to use and store. That’s enough for your 15 kWh of daytime use, and to charge your full bank of batteries too, plus more besides. Maybe you don’t need additional panels – in this situation – to support your extra batteries. Wow. So – more batteries? More panels? Truly, it totally depends on your present situation and the types of assumptions you are comfortable living with. Is this the point where we also mention our consulting services and how we can help you ‘tune’ the correct balance of power generating and energy storing capacities? Rates are reasonable and start at $250. Let us know if we can help. How much reserve power generating and energy storage capacity should you have at your retreat? Well, that depends on how much you have of both to start with, and then from there it depends on how pessimistic you want to be in terms of semi-random/worst-case scenarios for a shortfall between average days of sunlight and really bad days of sunlight. We suggest that your ‘normal’ system specification should already embody some conservative projections about how much power you’ll get on bad days in winter, and then from that point, add some extra battery and perhaps some extra panels. We often see solar panels sold with the assumption they’ll generate 5 hours worth of full-on energy a day. We tend to base our projections not on these best case summer scenarios, but rather on worst-case winter scenarios, where (particularly in the northern states) you’ll sometimes struggle to get even one hour of full-on energy from your panels each day. The good news is that even on the darkest dimmest gloomiest day, there will still be a very little bit of energy generated, so even if you exhaust all your batteries, you should still get a tiny trickle of electricity – enough to at least keep some lights going and maybe one or two essential appliances too. Oh – the big mistake present in the picture of the battery array at the top of the article? The problem is the batteries are outdoors. In winter time, the battery temperatures will massively drop, and the colder the battery, the less capacity it can store and return back to you. You want to keep your batteries as warm as you are – temperatures in the 70s are ideal. A lot of energy is wasted when hot water goes down your shower drain. There are lots of devices out there at present to make one’s life more energy-efficient. The problem that most of them face is that few of them are cost-effective when we’re paying so little for reliable ever-present energy. But if – when – energy prices skyrocket, and/or if/when energy becomes scarce and unreliable, all these devices will come into their own and become valuable and essential. Needless to say, as we prepare for ‘discontinuities’ in society, one of the biggest discontinuities we have to consider is an interruption to our energy supplies, and so it behooves us to consider all such energy-saving devices, not so much for their present benefit today, as for their future benefit, subsequent to TEOTWAWKI. Here’s an interesting article that profiles three similar but different approaches to recycling some of the heat from your shower’s waste water. 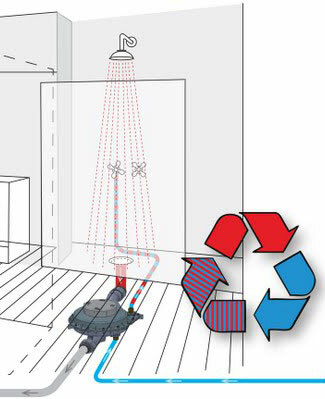 The concepts are immediately and intuitively sensible, and the savings apparently quite substantial – reducing the energy cost of the hot water used in the shower by up to 60%. Depending on how often you shower and how many gallons of water you use each time, this can reduce your daily energy consumption by 4 – 6 kWh a day. That might not sound like a lot, but when you consider that the average household uses 30 kWh each day, and your retreat will definitely use much less, this becomes a significant reduction in your total daily needs. While water heating may not be a fully mission-critical part of your retreat’s energy planning (we are assuming you’ll fit a solar water heater to supplement any other water heating strategies you have) there’s no harm and potentially some benefit in recycling every possible watt-hour of energy you possibly can, and these three approaches all seem reasonably low-tech and low-maintenance and sensible. Whether you buy the equipment from one of the three companies, or simply create your own similar system, it is definitely something to consider. All three companies come from NZ or Australia, probably because the magazine is published in Australia. Happy second birthday to us. Just over a year ago, we were writing a retrospective on our first year, and it seems appropriate to give you a second ‘annual report’ of sorts. It has been a strange year in many respects. The ammo shortage that appeared after the Sandy Hook shooting in December 2012 has lingered much longer than anyone would have ever expected, although the occasional reports of government departments buying extraordinarily huge quantities of ammunition probably provide some degree of explanation. On the other hand, any year with no appreciable level 2 or 3 crises is a good year, right? And while we’ve had a few ‘tremblers’ we’ve had no major earthquakes or eruptions or tsunamis or other natural disasters, and precious few unnatural disasters, either. North Korea has gone through some periods of ebullient threatening, but nothing has come of it – yet. We would do well to keep this country in our sights, because – as this article unsurprisingly and perhaps even unnecessarily reminds us – the North Koreans could easily destroy us, pretty much at any time and with no warning, with a single EMP pulse. Less public, but more worrying, is the continued and apparently unimpeded progress by the Iranians towards the completion of their own nuclear weapons capabilities, and in the last month or so, Russia has roused itself and taken back some of its former territories, in Ukraine, that it had previously considered as its own. Like much of Europe (and Asia and Africa) the validity of any nation’s claim to a contested area is never clear, and depends on how far back in the history books you choose to go in an attempt to see who were former or ‘original’ owners. In the case of eastern Ukraine, however, it is clear that the people there identify themselves more with Russia than Ukraine, they speak Russian rather than Ukrainian, and they want to be accepted back into Russia. You might think we should simply let the people on the ground choose whichever country they wish to belong to, but the leaders of western Europe (and our own leader too) seems to fear a resurgent Russia and are keen to keep Russia down. Will the ‘Ukrainian crisis’ create a flash point and be the spark that lights another global conflict? There are eerie parallels between some of the matters at present and those of exactly 100 years ago, in the months preceding the start of World War 1 (on 1 August 1914 when Germany declared war on Russia). The new strength of Russia is hard to ascertain, and its economy is weak, continuing to rely primarily on energy product and sales, and secondarily on the sale of other raw materials. But what is obvious is the country is generally united behind a strong martial leader (President Putin) and both literally and figuratively, he could beat our leader seven different ways to Sunday. Unfortunately, weak leaders are more likely to result in wars than strong leaders, because they allow themselves to get bullied too far into a corner and then find themselves with no obvious peaceful opportunity to then extricate themselves. In the east, China’s astonishing growth continues, albeit with some recent faltering in its economy. It is now the world’s second largest economy, although we in the US are still much larger (still nearly twice the size of China). Interestingly, if one is to view the European Union as a single economy (which is how they try to see themselves) then the EU is slightly larger than the US in terms of GDP. The third largest economy is Japan, and Russia comes at about 8 or 9 in most rankings, which makes it about eight times smaller than the US or EU economies). Is China an ally or a threat? It is hard to say; at present, there is so much economic interdependence between our two countries that we are reluctant allies, but we are perhaps like an unhappily married couple with both partners cheating on each other. In terms of non-country based threats to our world, no less a source than NASA is predicting that the world may collapse in the next few decades. And our overall vulnerability caused by the imbalance between city-dwellers, who rely upon other people providing for every essential thing needed for all of their lives, and the percentage of rural dwellers, not all of whom are involved in agricultural production anyway, continues to get worse, not better. 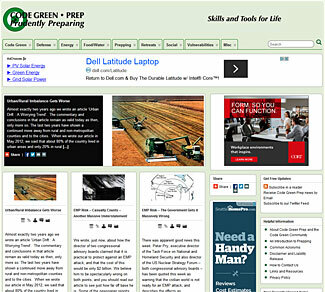 As for the website here, the last year has seen another enormous outpouring of content. Although there were some quiet months during which we’ve been unavoidably focused on other issues, we’ve added over 100 new articles totaling over 200,000 more words, and there is now more than half a million words of content for you here. There’s one other question that we should all ask ourselves, at least once every year. Are we better prepared now than we were this time a year ago? In our case, the answer ranges between ‘yes’ in some areas and ‘not so much’ in some others. As will probably always be the case, more work, more preparing, is always needed. We hope you continue to find material of value and that you continue to visit, and wish you great good fortune in your own ongoing preparing. May none of us ever need them. The development of hyper-efficient mechanized agricultural production revolutionized our country, but simultaneously increased our dependence and vulnerability on increasingly complex infrastructure. Almost exactly two years ago we wrote an article ‘Urban Drift : A Worrying Trend‘. The commentary and conclusions in that article remain as valid today as then, only more so. The last two years have shown a continued move away from rural and non-metropolitan counties and to the cities. When we wrote our article in May 2012, we said that about 80% of the country lived in urban areas and only 20% in rural areas. USDA data shows that now only 15% of Americans live in rural and non-urban areas. That shift from 80/20 to 85/15 is more significant than you might think – it is the difference between a 4:1 ratio and an almost 6:1 ratio. Of particular significance is that this population shift isn’t just being caused by the cities growing faster – it is caused by people leaving the rural areas and moving to the cities. There are now fewer people living in 1200 counties than there were in 2010 (in total, a reduction of 400,000 people), and while this has been partially offset by growth in 700 other counties, a net imbalance remains, with the cities an even more unbalanced part of our country (the USDA has an interesting chart showing which counties had growth and which lost people on the page linked above). The period 2010 through 2013 marks the first ever extended period of rural depopulation. Sure, often in the past, rural population growth has lagged behind metro growth, both in percent terms and also in absolute numbers, but now we are seeing four years of actual decreases. Furthermore, many of the remaining rural residents are not productive – they are either retirees, or ‘lifestyle’ dwellers who might actually have non-agricultural type jobs that they telecommute to. Many more are service/support workers – the people who work in the schools, the stores, and the local governments. The actual number of people who are self-supporting is remarkably few. Our cities increasingly rely upon food that has been grown using intensive/mechanized forms of production, and which are located increasing distances from the cities themselves. If our modern energy-intensive world changes, then the food can no longer be grown so efficiently, and it won’t be able to be transported as far, making for crippling food shortages in our cities and all that implies. In other words, in the last two years, the situation has got worse, not better. Cities have become even more dependent on even fewer people supplying them with the food they need. As preppers, we need to be sure we can supply our own food WTSHTF. 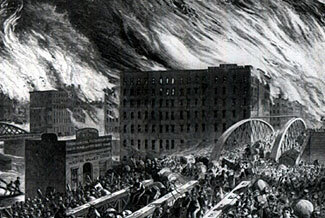 This artist’s impression of the tens of thousands of people fleeing the 1871 Great Chicago Fire could become a modern-day reality after uncontrollable fires break out following an EMP event. We wrote, just now, about how the director of two congressional advisory boards claimed that it is practical to protect against an EMP attack, and that the cost of this would be only $2 billion. We believe him to be spectacularly wrong on both points, and you should read our article to see just how far off base he is. Some of the newspaper reports, all of which uncritically repeat his quote, have widened their article to refer to another self-appointed EMP expert, Dr William Forstchen, who estimates that approximately half a million people would die in the first few moments after an EMP event. Okay, so maybe he is correct about that. Indeed, looking at the numbers in the article, if the 7,000 planes in the air at the time of an EMP event crash, and each plane has 150 people on board, then that is over 1 million people without considering however many casualties might also be incurred on the ground where the planes crash (probably not very many, actually, but that’s not the point we’re examining here). His further point about fires breaking out, and not being controllable, is definitely true. In the modern high-density city centers, and without any fire trucks or water, even small fires will quickly become multi-block unstoppable conflagrations. So what is the point we’re seeking to make? Simply this : The deaths in the first few minutes after an EMP are relatively trivial and inconsequential, compared to the deaths in the days and weeks that follow. Any article which talks about half a million deaths immediately after an EMP does the nation a disservice by not pointing out that tens of millions more people will die in the days and weeks after. Why will so many people die after an EMP? It isn’t as though an EMP creates any blast or heatwave, or even much nuclear radiation. The problem is that when the EMP destroys much/most/all of our nation’s electronics, it therefore destroys all our support infrastructure. Think about the most critical things we need to preserve human life. Shelter – with no electricity, we no longer can heat or cool our homes. For that matter, if we live in a high-rise, we can’t use the elevators any more, either. Food – Many/most trucks and trains will fail due to the EMP. Those that don’t fail will run out of diesel or electricity, and where will they get more? The refineries will also be offline – their control circuitry will have been ‘fried’. Without transportation, and without refrigeration, how will our supermarkets get restocked? So, somewhere between a few days and a few weeks, people will start dying from lack of water, lack of food, and from general disease due to lack of drinkable water and sanitation. People in the cities won’t be able to conveniently evacuate out of the cities, either because their cars will have failed (due to their onboard computers) or because they can’t buy gas to drive with, or perhaps because the roads are clogged with stalled/failed vehicles. On the other hand, the probable complete breakdown of law and order that will quickly follow an EMP (imagine the police with no cruisers and no radios – they’ll be uncoordinated and unable to protect or control the cities and will quickly give up trying) will definitely motivate people to try and flee the cities and go somewhere safe. Even if they could evacuate the cities, where would they go? 85% of our population now lives in cities, in situations where it is not possible to be self-sustaining and self-sufficient. 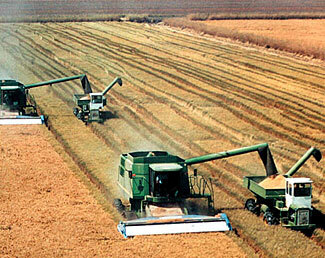 Our nation no longer grows enough food to support us, and that which we do grow relies upon mechanical production assistance – that too will have all failed. So, yes, for sure we’ll see at least a half million people die in the first few minutes and hours after an EMP attack. But that’s only the very tip of the top of the iceberg – how many more tens/hundreds of millions of people will die in the weeks and months immediately thereafter? That is the true headline that urgently needs exposing and national discussion. Now that we have you truly anxious, you can read more about EMP vulnerabilities here. 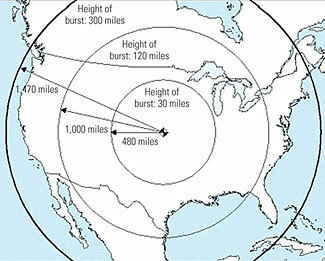 A single EMP pulse can cover the entire country with destructive EMF radiation. There was apparent good news this week. Peter Pry, executive director of the Task Force on National and Homeland Security and also director of the US Nuclear Strategy Forum – both congressional advisory boards – has been quoted this week as warning that the civilian world is not ready for an EMP attack, and describes the effects as catastrophic. In case you’re unfamiliar with EMP, please see our article that explains EMP to understand how and why it is such a chilling threat to our modern world. Anyway, back to Mr Pry. Yes, we agree with both his statements. So, what is the problem? The problem is not the technology. We know how to protect against it. It’s not the money, it doesn’t cost that much. The problem is the politics. It always seems to be the politics that gets in the way. If you do a smart plan – the Congressional EMP Commission estimated that you could protect the whole country for about $2 billion. Sounds very good, doesn’t it. But, let’s actually think carefully about his two claims and see if they stand up to even some simplistic investigation. First, let’s consider his claim that we know how to protect against EMP effects. Well, that is sort of true, but it is true in the same manner, perhaps, that we ‘know’ how to protect against teenage pregnancies. But, just as the ‘solutions’ to the problem of teenage pregnancies, while perfect in theory, have always colossally collapsed in reality and have proven to be completely impractical, so too do the ‘solutions’ to EMP effects have little application in the real world that the rest of us wish to live in. Essentially, there are five possible solutions to EMP. You choose the one you wish to adopt. 1. Place every piece of at-risk electronics inside Faraday cages. A Faraday cage is basically a metal box (ideally of iron or steel so as to protect against both electrical and magnetic energy), and electromagnetic energy goes around the box rather than through the box. This therefore protects the items inside the box. But, you can’t have wires going in or out of the Faraday cage. If you did, then the wires provide pathways for the EMP effects to enter into the cage. So, no external antennas (and internal antennas will be blocked by the cage) which effectively makes all radio type gear useless. Plus, yes, where will power come from to power the devices inside the cages? And so on and so on. Faraday cages can indeed fairly protect some types of electronics, but not everything. Have a look around your home and your office. Everything from your phones (wired or wireless) to your calculator to your digital clock and watch, to your oven and stove top and microwave, to the thermostat that controls your heating – yes, pretty much everything – is at risk from EMP effects. How much of all of this can you put in Faraday cages? 2. The next ‘solution’ is to ‘harden’ your electronics to make them less vulnerable to EMP effects. Hardening will reduce the certainty that your electronics will get fried by EMPs, but does not zero it out. Think of it a bit like making your watch water-resistant, or your jacket ‘showerproof’. Hardening is essentially something that is done in the design and construction of something; it is not something that can be subsequently added on. Hardening requires adding various types of filters and chokes, separating out components, and using special components that have been designed to be more robust when confronted with EMF induced voltage spikes (ie from an EMP). Hardened equipment is unavoidably bulker and heavier than regular equipment, and so is seldom ever encountered in consumer grade electronics, which place a premium on being as small and compact as possible. 3. You could replace all your high-tech gear with low tech gear. Instead of fancy digital phones, you could use old-fashioned rotary dial phones – well, maybe you could, if your phone exchange still supports rotary dialing (and if the phone exchange itself will survive the EMP event!). You could replace your new transistorized digital radio with an old vacuum tube powered radio (which will be much more dependent on mains power than your low current low voltage digital radio), and again, what use is a radio if there are no surviving radio stations. We’re not quite sure what you could replace your iPad or computer with, and what point would there be, when the entire internet will collapse. 4. You could adapt instead to a life with zero technology. But in that case, is the ‘cure’ worse than the problem? Imagine a life with no electricity, no cable, no internet. Oh yes, also without water or sewer, too. This isn’t really a solution at all, is it. 5. The fifth approach is to keep a spare set of everything essential you might need in a future ‘grid down’ scenario. But if you do this, you need to store them inside Faraday cages. Just leaving them switched off is not sufficient – the on/off switch in anything merely controls the flow of electrical power, it doesn’t physically disconnect circuitry from itself and from potential antennas that would collect and feed/funnel the EMP energy into the unit. There is another problem with this strategy. While it is great good sense to keep spares of everything essential, it also begs the question – how many spares do you keep? What happens if an EMP occurs, and you smile to yourself, break out your spares, and are back to normal functioning (albeit without any external support resources such as electricity or the internet), but then, a couple of hours later, a second EMP event occurs. Do you have a third set of everything also kept as spares for the spares? A fourth set for another layer of spares? It seems reasonable to assume that if a foreign nation chooses to attack us with an EMP, they would have the resources, sense and willpower to do the equivalent of a double-flush – first one EMP to do as much damage as possible, then a second event some hours later to destroy all the reserve equipment now being pressed into service. US DoD doctrine says to expect multiple EMP attacks, not just one (see the Field Manual, referenced below). One more thought on this point before moving on to the second fallacy in Mr Pry’s strange statement. Even if you reduce your own vulnerability to EMP-effects, what good does that do you? Maybe your own electronics are intact, but if the power grid is down, you have no electricity to power them. Maybe your car’s several dozen computers also successfully made it through the EMP event, but if the gas pumps at the gas station don’t work – both due to no electricity and also due to their own electronics being fried – how much use is your car to you? And how would you pay for the gas, even if you could get it? The banking system will be down, card readers won’t work, and you probably only have a day or two of cash in your pocket. Oh yes, the roads will probably be blocked anyway, with less fortunate cars just stalling in the middle of the lanes they were in at the time. Think of the chaos from a sudden winter snow-storm, then multiply it, to get an idea for how driveable the roads will be. The EMP risk is not just a risk to ourselves personally, it is a risk to all the infrastructure about us that we rely upon in our lives, but which we can’t control. 2. A $2 Billion Cost? Mr Pry says it would cost $2 billion to protect the whole country against EMP effects. Now, to me, and probably to you too, $2 billion is an unthinkable amount of money, and we could do many enormous things with such a huge sum. But, to the government, $2 billion is nothing. It represents little more than $6 per person in the country. The government’s total budget for 2013 was $3.5 trillion, 1700 times more than $2 billion. Sure, this suggests that the $2 billion is affordable, but it is also negligible. We spent $8.2 billion on the Army Corps of Civil Engineers, $18 billion on NASA, $35 billion on the Energy Department, and $673 billion on defense. Two specific examples. California is currently planning to spend almost $100 billion on a fast train service between San Diego, Los Angeles, San Francisco and Sacramento. A new air traffic control system for the country is projected to cost somewhere between $40 billion and $120 billion (no-one seems quite sure exactly how much). So tell me, if you can, how we can’t build 1,000 miles of train for less than $100 billion, and we can’t redo our country’s air traffic control system for less than a similar cost, but we could protect all the gazillions of vulnerable pieces of electronic equipment for a mere $2 billion? Oh – we forgot to mention, and apparently Mr Pry forgot this, too. One of the biggest vulnerabilities to EMP is our national electricity distribution grid (click the link for one of our articles on this topic). If the grid failed, it could take years to restore (if for no other reason, due to the lead times to get new transformers made and delivered). The cost of hardening the grid? According to this 2012 article, probably $1.5 – $2 trillion dollars. So, please, make a case – if you can – for how, with $2 trillion to harden the electrical distribution network alone, we can harden that and the rest of the nation’s infrastructure too, for only $2 billion. This $2 billion claim is beyond unbelievable. Why does Pry make this claim? For that matter, why does he also say that EMP attacks can be defended against in the first place? Both claims seem to be total utter nonsense. The US Army Field Manual 3-3-1 has a useful appendix in it (Appendix C) that gives information on EMP. You can download it here. Unfortunately, the manual is twenty years old and there is no sign of an updated edition having been released. Much of the material in it is based on studies and ‘state of the art’ design that is even older still. While the nature of an EMP effect has of course not changed much in the intervening 20 years (there are some suggestions that the former ‘limit’ on the maximum power of an EMP, caused by over-saturating the atmosphere with radiation, may have now been resolved, allowing for even higher powered devices with more severe effects) there have been enormous changes in technology. The FM appendix repeatedly refers to the frequency of EMP radiation and ties that to being of greatest risk to radios that transmit/receive on the same frequencies, but understandably fails to consider the implications of one of the biggest changes in the last 20 years – the ever greater miniaturization of our electronics. As our chips get smaller and smaller and more densely packed with components, the separation between each part of the components gets smaller and smaller, meaning that the voltage level needed for a ‘flash over’ between one component and the next has gone down and down proportionally. When the manual was written, typical distances inside chips were in the order of 750 – 1000 nanometers (a nanometer is one billionth of a meter). Today, distances are 15 – 20 nanometers – 50 times smaller. Densities of components are even more staggeringly enhanced – in 1994, a Pentium chip had something slightly in excess of 3 million transistors on it, today, an Xbox One main chip has 5 billion transistors on it. All electronic devices are therefore massively more vulnerable than they were in 1994. It is also important to realize, as the manual itself hints at, this is an unclassified manual written with an eye to who else will be reading it, in both friendly and unfriendly places. The manual is therefore more likely to put a positive spin on things, rather than say ‘If an EMP occurs, we’ve lost the battle before it starts’. So, by all means read it, and learn from it, but appreciate its limitations and how the world has changed since then as well. How Much Solar Power Generating Capacity Do You Need? Chances are you’ll end up choosing to cover most, if not all your roof with solar panels. We’ve already written an article pointing out something you hopefully already know – solar power is a wonderful energy source for preppers. If you don’t already have some solar power on tap at your retreat, you should urgently add some. But – how much solar power do you need? That’s clearly an essential question to ask and answer. But answering it is not as easy as asking it (hence this article!). There are two drawbacks (or, if you prefer, ‘complications’) when it comes to assessing how solar power can meet your energy needs. The first is that every night, when the sun goes down, your solar power generation drops down to zero, and doesn’t start again until the next morning’s dawn. You’ll have to create enough energy during the hours of strong sunlight to have sufficient to store (ie in batteries) to see you through the nighttime, too. This is actually the less serious of the two drawbacks, because this is something you can readily understand and plan for. The possibly more important drawback is that the power you get from your solar panels depends on how much sun there is, each day. A bright sunny day without a cloud in the sky means you’ll get lots of power from your panels. A light haze and some high-up cirrus clouds, while hardly detracting from your overall perception of a bright sunny day, might cut the power you generate by 20%, possibly even 30%. As for when there are clouds covering the sun, well, your power generated might drop down to barely one-third of what it could in optimum conditions. It is still clear ‘bright’ daylight and you can see perfectly well, but the clouds have blocked much/most of the sun’s energy from reaching you. This means when you plan for a solar sourced power supply, you need to have an array that is many times more powerful than you might think you need (so as to provide sufficient power on cloudy as well as bright days), and you need to support the array with a large reservoir of power storage (ie almost certainly batteries – see our article on using batteries to store electricity and the other articles in that four part series). As an aside, while this seems to be an unfortunate situation, with the total energy ‘harvested’ from the sun varying widely and not very predictably from day-to-day, at least on the very gloomiest of days, you are still getting a small trickle of energy – it is only at night-time that the energy flow stops completely, so you always have some tiny emergency supply. This is not the case with wind power, where on some days (too windy, or not windy enough) you will get no energy at all. The good news is that solar panel systems are reasonably affordable, and the further good news is that there is very helpful data to help you understand just how much energy you can realistically get from your panels, if not hour by hour, at least on an averaged basis, daily/weekly (note – this helpful information is usually not the materials provided by the seller of the panels!). The most important part of the specifications of solar panels, for this purpose, is to see how many watts of power it is rated to generate. Sure, there’ll be other data ranging from size and weight to how it should be mounted, and you’ll also see information on voltages and current ratings, but focus primarily, when planning your array, on the watt rating. Almost certainly, this watt rating will assume that the panel is directly facing the sun and that the sun is operating at ‘full rated power’ – ie, 1 kW of radiated energy landing on every square meter of panel surface. As of the current time, it is normal to expect to see panels that are about 15% efficient – ie, they will create about 150 W of electrical power for every square meter of panel surface, in these ideal conditions. But, as you well know, life is seldom ideal, and the sun doesn’t always shine. Even when the sun is shining and there are no clouds blocking it, the panel isn’t always directly aimed at the sun (because the sun moves around the sky each day), and the more ‘off target’ the panel is, the less efficiently it converts sunlight to electricity. Furthermore, it is common for panels to slightly under-perform their rated power output, albeit only by a few percent, and as they age, their power output slowly drops further (by about 0.5% – 1% a year). And then, from the power output at the panel connector, you start losing power through things such as wire resistance as the power travels from the panel to your appliances, and conversion losses as you convert the panel’s low voltage DC into high voltage AC for your appliances. 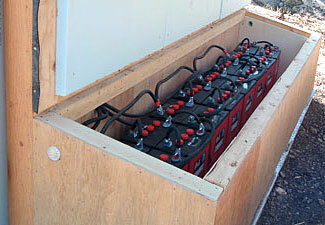 If you are storing the panel’s power into batteries, you are again losing power in the process of converting the electricity from the panel voltage to the appropriate battery charging voltage, and then from that into chemical potential energy in the battery (and then back to electrical energy when you start running things from the stored power in the battery). There are other output modifiers to consider as well. For example, a partial shadow falling on less than 10% of a panel doesn’t reduce the panel’s power output by 10%, but rather maybe by 50%. So be very wary of using the rated panel power outputs without understanding exactly what this means and making the appropriate adjustments – ie, probably massively reducing down the number! One more word of caution. A panel should only be rated in terms of watts (or maybe kW) of power output. Sometimes you’ll see this rating then converted into (kilo)watt hours of energy generated per day/week/month/year. This is a terribly fictitious number, which you should ignore totally, because it is almost certainly based on a ‘best case’ number of hours of bright sunlight per day/week/month/whatever, and as preppers, we never want to build our future on ‘best case’ assumptions, do we! (By the way, if you’re a bit confused as to the difference between power and energy, please visit our page that explains this – understanding the difference between power and energy). You must – you absolutely must – create your own calculation for how many kWh of energy you’ll get from your panels, using worst case rather than best case scenarios, in winter rather than summer, and based on the sunlight values applicable to your specific location. This article and others in the series helps you do so. The first thing you need to do is create – well, for want of a better term, an energy budget for your retreat. How much energy are you going to allow yourself every day or month, and how much of that energy will be in the form of electricity? The chances are you’ll have a multi-energy strategy for your retreat – you will most likely have some type of wood burning energy source; and for finite term level two situations, you might have propane to power your cooking appliances, you might use solar/thermal energy to heat your water, and so on. You might also have multiple electricity sources – a generator (suitable for level 1/2 situations, but less so for level 3 because you’ll run out of fuel) as well as solar power. Perhaps there’s even some wind power, and in very rare situations, you might have a micro-hydro generator too. For the purpose of this article, our primary focus is on electrical energy needs, and we’re also assuming that this electricity will be sourced solely from solar panels. Feel free to adjust the process if you’re incorporating other electricity sources too. So, how much electrical energy (from solar panels) does your retreat need; and perhaps also, how much more than the bare minimum would be nice to also have? We suggest you work through this question for three scenarios – summer, fall/spring, and winter. There will be changes in your heating, cooling, and lighting needs for these different times of year. We also suggest you might wish to assign each item a priority – ‘Must Have’ for the absolute essential items you can’t live without, ‘Should Have’ for some extra items that make life more pleasant, and ‘Would Like but Don’t Need’ for the luxuries that you’d like to be able to treat yourself to but probably can’t. Sometimes you might have an essential item that you record a certain amount of usage for in the must have category, and additional usage in the less essential categories, too – maybe you plan for an hour a day of radio monitoring as a must have item, but then add another few hours of radio listening in the ‘Should Have’ category, and a few more hours in the ‘Would like but don’t need’ category. Add it all up, redo for the different seasons, and you’ll end up with your total energy requirements. If you did this thoroughly, you’ll have nine different numbers (three seasons multiplied by three scenarios). These numbers are all interesting, but the most important number – the one you’ll start from – is the highest of the three ‘Must Have’ numbers. This is your absolute bare minimum energy requirement; depending on your budget and other constraints, you’ll of course try to build your system bigger than this. Here’s a helpful list showing some of the wattages of various home appliances. The second thing you need to know is how much power your retreat needs to get the energy you’ve calculated in the preceding section. You’ll understand this distinction from our article explaining the difference between power and energy. What is the maximum amount of power your retreat will require at any given moment? Add together the power requirements of everything that might be on simultaneously, and include an allowance for startup power peaks. You need to do this only once, for a scenario where you have whatever you want simultaneously operating. Due to the difference between power and energy, there is no need to redo this for each of the nine scenarios you were studying above. As you’ve probably now calculated, although your house/retreat might have modest total energy consumption, it still might have occasional massive peaks in maximum power requirements. You want to keep your peak power requirement as low as possible, as well as your total energy consumption – this will allow for smaller more economical systems for your property. One easy way to do this is to have ‘either/or’ circuits in your house. For example, maybe you have things set up so either your washing machine is on or your dryer is on, but never both. The easiest way of doing this would be to have the two units sharing the one power outlet, so that only one can be plugged in at a time. Maybe you also have an either/or setup for your kitchen – either your dishwasher is on, or your oven and stove top are on, but never both. Perhaps this is controlled from an electrical distribution panel, where you have a switch that can be set to either enable one circuit or the other, but not both simultaneously. Maybe you also have a switch that powers on either your laundry or your kitchen, so you now have two levels of either/or – ‘Either I have something in the kitchen on or something in the laundry on, and if it is something in the laundry, it is either my washer or my dryer’. Another example would be either your hot water heater or your furnace – because they both cycle on and off, you’ll not notice the difference at all if you have it set up so they alternate drawing power (as long as their duty cycles are less than 50% each, which they should normally be). Either the lights in the living areas or in the bedrooms and bathrooms. And so on, any which way that makes sense for your lifestyle and living situation. Another and more ‘automatic’ solution would be, if you have, for example, a separate fridge and freezer, would be to put them on timers. Maybe you have the fridge on a timer that runs for the first and third quarters of each hour, and the freezer to run on the second and fourth quarters. Better would be to have the fridge running for 13 minutes, then a two minute gap in case the timers get out of synch, then the freezer for 13 minutes, and so on. Or get a timer that has multiple outlets so it is always in synch with itself, alternately switching on and off different circuits and appliances. Some other examples of ‘either/or’ scheduling might just require some personal discipline, or a different way of controlling things – for example, don’t do the vacuuming at the same time you do the ironing (both require over 1kW of power). Maybe you keep the iron and the vacuum cleaner in the same place with a big placard saying ‘Do not use both of these items simultaneously’. Indeed, it doesn’t have to be limited to a simple either/or choice between two things. Maybe it is a ‘choose any one of three’ things – in addition to the iron and the vacuum cleaner, perhaps you also have the hair dryer in the same place and the big placard now says ‘Only use one of these three things at any time’. You can adjust your instantaneous power requirement down by adopting some of these strategies. 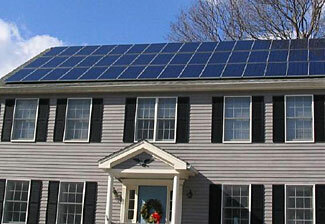 Remember that solar power only flows from your panels when the sun is shining. It will flow at the greatest rate around the middle of the day, when your panels will be most perpendicular to the sun, and at lesser rates before and after that time. So, for anything that you can conveniently time-shift into the middle of the day, you should do that. Other things, wherever possible, still try to schedule for daylight hours rather than nighttime so as to take power direct from the solar panels rather than from the batteries. For example, instead of having a shower, washing your hair and then drying it at night, do that in the morning when the sun is shining and your panels are giving you power for the hair dryer. It is always better to use energy direct from your panels than to require the energy to detour through a battery system – this keeps things simpler and cheaper, and your batteries will probably fail long before your panels do. In winter time, cook hot meals before the sun sets. Do all your ‘chores’ that require appliances during the day, not at night. Work out the power profile and total energy you need during the daylight hours and do a similar calculation for the night-time hours. We suggest you consider daylight to start from perhaps 30 minutes after sunrise and to finish perhaps 30 minutes before sunset. Sure, there’ll be some sunlight and energy flow in the time you’ve omitted, but keep that as ’emergency/bonus’ power. It won’t be all that much, anyway. So now you should end up with information for the peak power consumption and total energy needed, day and night, for the three seasons – spring/fall, summer and winter, with splits showing essential power, desirable power, and not necessary power. Well done. Let’s now look at what you do with these numbers. Use the resources on this page to see how many sunlight hours a day you can expect at your location for winter, spring/fall, and summer. Use the monthly PV Solar Radiation (10 km) static maps. Now you are going to need to start massaging the numbers and making some assumptions. What you see on these maps are the average daily sun hours. But we know some days will have more than this, and other days will have less than this. Do you want to plan your energy supply based on the hope that you never have a bad day (in terms of sunlight)? That would be foolishly optimistic, wouldn’t it! You need to be willing to spend some more for additional capacity so as to allow for some days giving you less energy than average. Anyway, let’s say you reduced the sunlight rating by 50%, and let’s say that your retreat was in an area with 2 – 2.5 hours of sunlight a day in winter. So you are now looking at 1 – 1.25 hours of sunlight a day; perhaps you’ll round that down and call it 1 hour, or perhaps you’ll take the midpoint and call it 1.125 hours. Your call. You also look up sunrise and sunset tables for your location, and see that on the shortest day, you have almost 9 hours between sunrise and sunset, and after taking off 30 minutes from the sunrise and sunset time, that leaves you with 8 hours during which there will be useful power flowing from your solar array. The first thing you now know is that you’ve got 1.125 full sunlight hours to generate 20 kWh of energy. You need your panels to be rated to give you 17.8 kW of power in full sunlight, plus some extra to allow for inefficiencies and losses in the system – at least 10% extra, and better to go up 25% extra. We’d suggest a 25 kW system would be the minimum to handle this. There’s an interesting extra thing you now know, too. With 1.125 sunlight hours, spread over 8 hours with the sun in the sky, your system will typically be generating power at about 1.125/8 of its full rated power, ie, at about 14% of its 25 kW full power rating – about 3.5 kW. Sometimes it might go way higher than this, and other times, it will drop down below that. But what you know, from this, is that you’re not likely to be able to run much more than about 3 kW worth of appliances simultaneously during the eight hours of the day. If you need more instantaneous power than this, you’ll probably need to increase your system’s capacity beyond 25 kW. On the other hand, you will have a flood of ‘bonus’ power – instead of it trickling in to your retreat at 3.5 kW, it will be flooding in at 25 kW. It would be nice to have some ways of using/banking/storing this extra power when it does come in (maybe heating your hot water hotter than normal at such times, maybe using appliances more, maybe slightly overheating or overcooling your retreat, and so on). You can – if you wish – do the sunlight calculation for the three different seasons and match that against the power requirements for each of the three seasons, but probably you’ll find the critical calculation will be the sunlight available in winter matched against your winter energy needs. Now to consider the implications of your energy storage needs. Continuing the example from the previous step, you know that you need to store 5 kWh of energy for night-time, while the sun is down and the solar system isn’t generating any power. So clearly you need a battery capacity sufficient for this, and with some extra to allow for the power losses between converting from the energy stored in your battery bank to the electricity for your retreat. Calculating the amount of battery capacity you’ll need is a complicated process, and we discuss it in this article – Using Batteries to Store Electricity. You need to allow for the fact that not all the energy stored in the battery can be converted back to electricity, and you need to also adjust for the fact that you’ll probably only want to discharge your batteries down to somewhere between 50% and 75% of their rated capacity (depending on the battery type you have) each night, and adjust further for the rate of discharge being, for much of the time, probably faster than the discharge rate used to calculate their capacity (the faster you discharge a battery, the less charge you’ll get from it). Oh yes, the battery capacity is probably also based on the possibly unrealistic expectation that it is stored at a temperature in the high 70s – and as it gets colder than that, it loses capacity (at 50°, you’ve probably lost 10% of its capacity due to the colder temperature, and at 30° you’d have lost 20%). So, put all that together, and what do you get? Some sort of a guess figure – in this case, if I had batteries I was comfortable discharging to 75% of capacity, I’d first say ‘5 kWh is 75% of 6.7 kWh’ and then I’d adjust for the discharge rate used to make the 6.7 kWh capacity, which might require another 20% increase in capacity (up to 8.3 kWh) and then maybe I need to add another 10% for converter and distribution losses (taking us up to 9.3 kWh), and then another 10% for the batteries being stored at less than 77°. That takes us up to 10.3 kWh, and so I’d probably round that up to 11 kWh. Note that this means that your earlier 20 kWh of energy figure, based on 5 kWh of battery power, needs to be increased for these losses. You sort of did that already when you went from 20 kWh to 25 kWh, but if your battery power needs are much larger than in this worked example, you might need to adjust up even further. So, you’ve worked out how much energy you need, and when you need it. You’ve also worked out the maximum power supply you’ll need, and you’ve done the calculations three times, variously for spring/fall, summer and winter. Maybe you’ve done them even more times, to adjust for the bare essential minimum of power, some more power that would be desirable, and still more power that would be ‘luxurious’. You’ve also worked out the hours of effective sunlight you’ll get at the worst points of these three seasons, and adjusted down from there for a ‘worst case’ scenario, and used that to work out the specifications for the solar panels you need and their power generating ability, and how much battery storage you need to see you through each night. Actually, no. You probably should now add some extra margin into your figures to allow for truly worst case scenarios – for two or three or four days with much less sun than you were figuring on happening in a row (and, when you think about it, really bad storms can last for several days, can’t they). You also should include some system redundancy for failures and other unexpected events. How much more do you need to add to your system? Please read the next article in this series – ‘How much emergency/reserve capacity does your solar power system need‘ for a detailed discussion on that point. For now, you’ve worked out that for your retreat, needing 15 kWh of energy during the day and 5 kWh of energy at night, and with winter sunlight averaging 2 – 2.5 hours a day, you should choose a solar system rated at 25kW and a battery bank with 11 kWh of storage. Please keep reading to see how much further this will need to grow. If this is all a bit too much for you, we are happy to consult with you and do most of this all on your behalf, and to walk you through the personal preference/lifestyle choices that we can’t make for you. Rates are reasonable and start at $250. Let us know if we can assist.